Crane training and crane operator certification are perhaps the most important contributors to crane safety in the construction industry. Not only is choosing the right crane training provider necessary for safe crane operation, there is no substitute for crane related experience. Experience is how an employer can separate crane operator qualification from crane operator certification. OSHA has always required crane operators to be qualified. But in the last decade more and more states, cities, and companies have started requiring crane operator certification or a crane license. Federal OSHA will start requiring crane certification for all construction crane operators in November 2014. Crane operator certification has had its supporters that believe that everyone should demonstrate a minimum level of knowledge and be issued a certification card. However, it has also had its opposition, who think that by getting a crane certification, an operator that passed a written test and swung a weight through a test course has the same perceived or tangible qualification as a veteran crane operator. A crane certification means you have demonstrated the minimum knowledge necessary by the certification company to operate a crane (crane license to learn). For entry level crane operators, practical or hands-on operational training is definitely recommended. Either way,whether you agree or not it doesn't matter, the law requires it. There are many crane training schools to choose from to obtain your crane operator certification. Don't send a crane operator to a school thinking they will become qualified! It's not going to happen without industry experience, which cannot be substituted with a classroom setting. The candidate may learn many aspects of cranes, such as crane inspection, crane maintenance, crane setup, and operation. However, if you want to get the crane operator certified, crane schools are most likely the right choice. Crane training schools range from a few days to several months in duration. The length of the class does not necessarily yield the results you might be trying to obtain. Some schools focus on crane safety training, signaling a crane, and crane rigging. Others focus on crane operator certification test preparation. 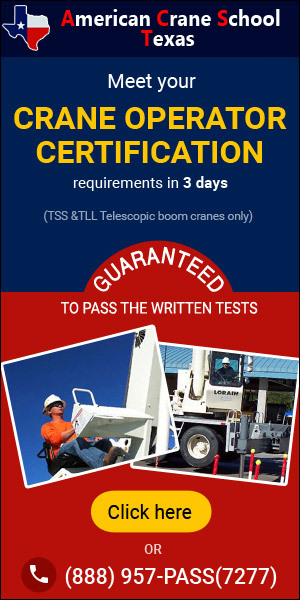 There is a limited amount of knowledge required to pass the crane certification written tests. Overexposing yourself to too much crane information could actually be a disservice to passing a crane test. If you seek a certification, you need to pass a written test and a practical (hands on) test. Once you have done that, you can expect to get a shiny card in your pocket that states you are certified. Remember anyone can claim they can teach you how to pass the crane operator certification tests. Make sure the company has some kind of a guarantee to back it up, or you might end up paying for another class somewhere else to finish the job, taking valuable time, money, and production costs. Find crane training schools at Cranehunter.com. 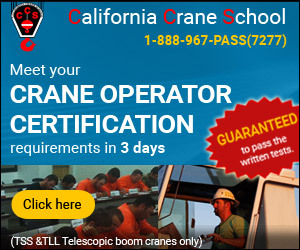 Crane Operators Certification and Inspections Inc.